One of Western Australia’s most unique holiday towns is ready to welcome you. Mandurah, only 74 km south of Perth, offers the perfect getaway for you and your loved one. Relax and find yourselves again with a romantic, 48-hour getaway in Mandurah. Stay in luxury and style by the seaside or the famous estuary canals or the nearby Marina and beach facing hotels. We’ve compiled a great itinerary and list of ideas to plan your trip. Welcome to Mandurah. First off, let’s find some accommodation for you and your partner. We start with hotels. Check in to your accommodation. Hotels & Short Stay Apartments options…. The Seashells Hotel, between the Beach and the Marina is one of Western Australia’s most exclusive hotels. The 4.5 star property offers a range of apartment and villa style rooms, with views to Comet Bay and the Indian Ocean and an amazing infinity pool between the beach and the hotel. See more. Overlooking the Mandjar Bay and Marina, the Sebel is perfectly located in the heart of the entertainment precinct of Mandurah. The property offers a heated swimming pool, fitness center and a range of room options, including spa suits and multiple bedroom apartments. See more. Boutique beachfront accommodation, located near the Mandurah Ocean Marina, and close to the foreshore and beaches, Mandurah town center. See more. Now you can have a Bali experience just an hour from Perth – without the airfares & passport. A 5 minute walk to stunning Avalon Bay, experience resort style comfort as a B&B. Offers two guest rooms with great facilities set among tropical gardens, with easy access to a pool and garden lounges. See more. Enjoy a luxury waterfront apartment experience, with beautiful canal views from every room, including your own private jetty. See more. A Luxurious mansion, the B&B Port Mandurah is right on the canals, with two queen bedrooms with ensuites, one with a spa bath. Guest lounges and large balcony overlooking the waterways, with a private jetty. See more. Now you’ve settled into your accommodation, let’s eat. We recommend a visit to Café Coast Waterfront Restaurant. 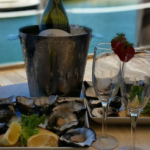 A Licensed bistro on the water, with great views of the marina and fantastic food and service, enjoy the afternoon a glass of wine or sparkling. See more. Now you’re relaxed and fed, let’s hit the water for a shared adventure. Book a Jet Ski Tour with Nautical Adventures. Self-drive jet skis with no license required, offering open ocean jet skiing and the opportunity to explore and potentially see Mandurah’s famous dolphins and unique waterways. See more. Hire a boat for a few hours, from runabouts to bowriders, pontoons or sun trackers. Alternatively, hire some bikes and explore Mandurah’s streets, parks and foreshore. See more. Pontoon boats, fishing and crabbing equipment or spend a few hours kayaking. Enjoy a cruise on the Canals, through the marinas and nearby Estuary and Murray River. See more. We recommend an hour of pre-dinner drinks at the Oyster Bar, overlooking the Marina. Mandurah’s only dedicated wine bar with an excellent selection of the best drops. Happy Hour is 6-7pm with ‘Oyster Hour’ on Friday nights. Enjoy grilled oysters, antipasto dishes, and light snacks. See more. Take a short walk to Flics Kitchen for a fantastic meal for two right on the Mandurah Foreshore. With a menu designed for sharing, request a variety of dishes, with recommended wines and local craft beers. The menu offers a range of local, fresh WA produce, including of course, Mandurah’s Blue Manna Crab. See more. Start the new day with a refreshing breakfast, perhaps at the Ocean Marina. There are a number of fantastic cafés to enjoy a beautiful breakkie by the water. MOKA, located at Dolphin Quay, is a place where you find mouth-watering meals and great coffee, service and magnificent water views. See more. Right on the water, D’Lights Café offer Breakfast, Lunch and coffee. Generous sized meals, great tasting food and great service. See more. The café is known for great coffee and tasty baked goods. Every Friday at DPM is donut day, with the café offering a range of unique creations, including passion fruit cheesecake with marshmallow fluff. Worth a visit, especially if you have a sweet tooth. See more. There are several public art trails you can follow in Mandurah, including in the city and around the Marina, detailed below. See more. This public art trail will take you on a journey through the city centre of Mandurah, along the Eastern Foreshore and the pedestrian area. The trail is a 1.5 km walk, beginning at the Mandurah Visitor Centre and ending at Mandurah’s Eastern Foreshore. There are 15 works of art to see. Journey along the famous Venetian style canals of Mandurah and across the Ocean Marina. A 4.5 km return walk, with 18 artworks to see. Begin at the Mandurah Visitor Centre and finish up at the Contemporary Art Spaces Mandurah (CASM). This beautiful wetland area located in Erskine, Mandurah features beautiful nature walking trails along the estuary and opportunities to spot unique bird life. The trail also features spectacular floral blooms in the spring months. There is also a wetland connected to the reserve with walk trails around. You’ll come across great grassed areas for relaxing and picnicking. See more. Situated less than half an hour’s drive south of Mandurah, at Lake Clifton in the Yalgorup National Park. The thrombolite reef is the largest in the Southern Hemisphere – discover some of the oldest living rock-like structures found anywhere on Earth. See more. Grab some delightful baked goods from Pinjarra Bakery & Patisserie for the trip home, or stay and enjoy a few hours here. See more. Finish your 48-hour getaway with a stop in Jarrahdale for lunch and wine tasting at Millbrook Winery. Millbrook Winery is an award-winning property and restaurant, only a 40 minute drive from Mandurah. Millbrook Winery focuses on providing a fresh and local experience with the kitchen growing their own fruit and vegetables on the property. See more.